Have you ever thought more about your cycle? Do you see it as an inconvenience? Or a blessing? According to Traditional Chinese Medicine from the time you start your period to the start of your next cycle your body works within its own natural rhythm. Being mindful of each of these phases better connects us to our body and understanding how to use this to our benefit. It’s important to nurture our body and mind through each phase of our cycle and find balance and harmony within our body. In my program, ‘Health WITHOUT the hard’ I talk more in depth about your cycle, and how to cycle sync! This means, using your cycle to your advantage. If you knew that during week 2 you would have more energy and it was a great time to book dinner dates with friends and socialise – wouldn’t you take advantage of that? Then on weeks when you feel more inclined to curl up in a big dooner and watch Netflix, wouldn’t you want to plan your days so you don’t feel exhausted and tired at an event? If you would like to learn more click here! 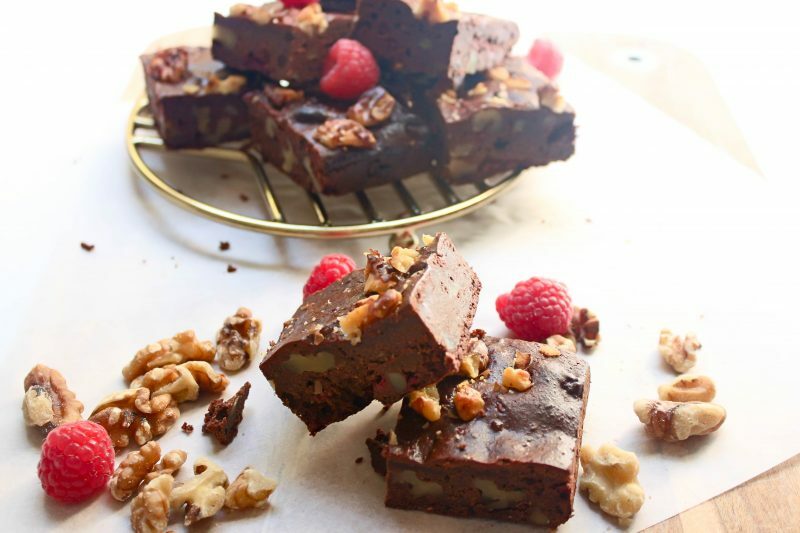 So, in the spirit of Menstrual Cycles and happy, healthy Hormones, I created this hormone balancing, superfood, nutrient dense version of an old favourite BROWNIE! Cocao: Not to be mistaken or confused with its weller known, processed cousin COCOA (No thanks). Cocao has high levels of antioxidants anti-ageing and liver supporting nutrients. Along with the super nutrient itself, Magnesium which helps to improve our mood and relieve stress, it’s also amazing to release the anti-inflammatory response during your pre-period week when the bloating kicks in! You can also try a magnesium supplement or oil, and rub directly onto your lower stomach to help reduce inflammation and pain. * of course consult your Integrative GP before starting any form of supplements ort changes in your diet. 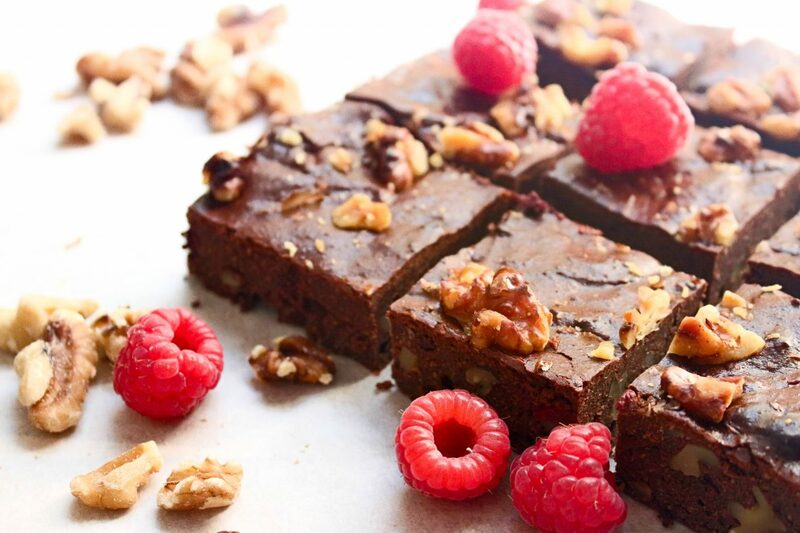 Raspberries: Not only does the sweetness and tartness of the raspberries make it easy to remove any added sugars to this recipe but they are loaded with benefits! Thanks to a number of powerful antioxidants and alkaloids raspberries have such a diverse range of health benefits such as, aiding in digestion, boosting the immune system, nourishing the blood, reducing inflammation and boosting healthy glowing skin! It’s important to reduce your intake of processed sugars during the lead up to your cycle so your body is not overloaded with inflammatory foods. Hence the RASPBERRIES!! Walnuts: Omega 6 fatty acids are pro-inflammatory, while omega 3 fatty acids are anti-inflammatory. By avoiding pro inflammatory fats (like processed vegetable oils and processed foods containing them) and increasing your omega 3 intake you can help the body naturally find the balance with your hormones. Things like Walnuts, Chia seeds and Flax seeds perfect for this – so I have included walnuts in the recipe – feel free to add other types of healthy fats your diet throughout your cycle. Maca: This has been used for centuries for energy, stamina and hormone balance, fertility and sexual function. Maca is an ‘adaptogen’, which means that it helps the body to ‘adapt’ to stress. It may also be able to help reduce symptoms of weight gain and bloating around your cycle. 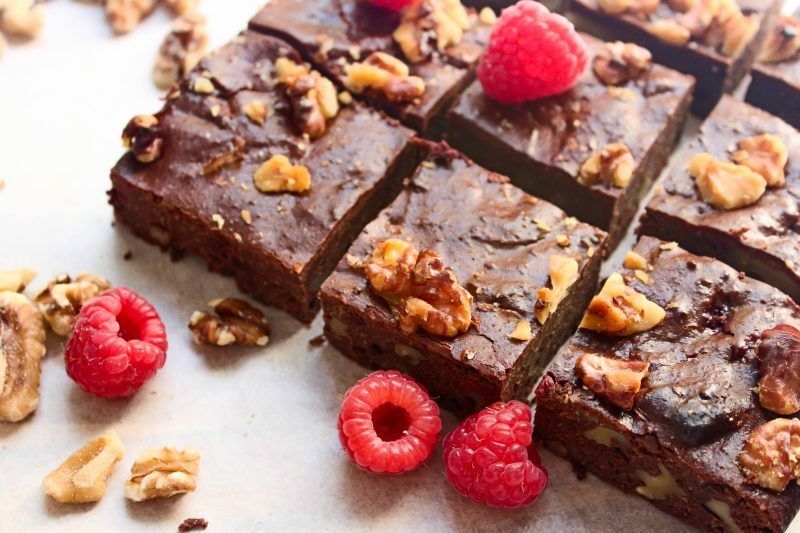 I am all about enjoying life, and what kind of life would it be if you couldn’t enjoy freaking brownies!! So let’s get baking beauties! Empower & Educate busy millennial women, just like you to take control of stress & their health! From Smoothies to Self-Care! Optional: If you need them a bit sweetener, feel free to add a couple of tbsp of Honey or Rice Malt Syrup – but personally I don’t think they need it! Preheat oven to 180 C. Line a Baking Dish (not too wide or deep, depending on the thickness you like your brownies) with Baking Paper. Melt the chocolate in a medium sized bowl, over a medium heat. Once melted remove from heat and add coconut cream, mix gently to combine. In another medium sized bowl, whisk eggs until well combined. Add the chocolate mixture, mix until well combined. Add almond meal and mix until well combined. it should start to form a gooey brownie mixture. Gently add raspberries and walnuts, fold through. Spoon the mixture gently into the baking dish. Place in oven for 20-22 minutes. Remove from the oven and allow to cool for 10 mins. Gently transfer to a plate/tray or serve immediately. These taste amazing with a dollop of coconut ice-cream, or banana nice-cream! Enjoy! Click Here to Download your FREE ‘The Fast & The Nutritious Smoothie Hacks!’ E-Book!